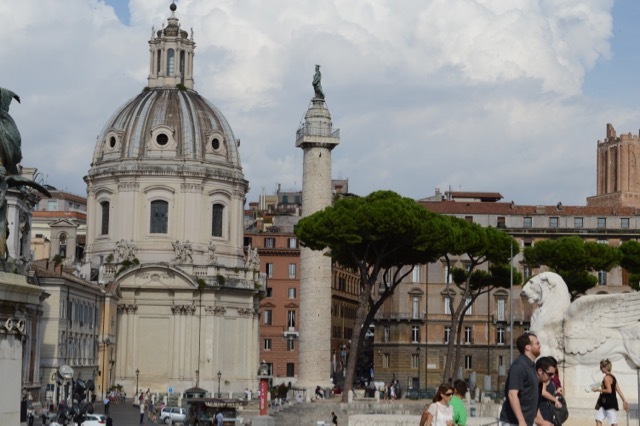 Last week I talked about being in Rome in 2014. 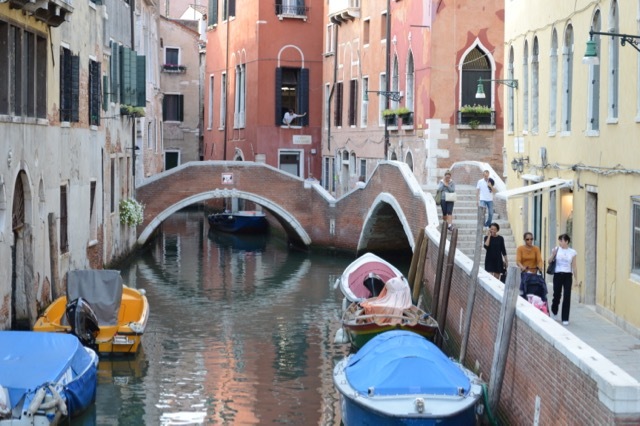 From there we went by train to Venice – a city of water and bridges! Inspiration was everywhere, but water was a big part of all of it. Here again, it was the ordinary parts of daily life that attracted me. There were, of course, more doors but here the windows seemed to draw my attention. Maybe it was the narrow ‘roads’ where we walked because you could never get far enough back to really see the doors. 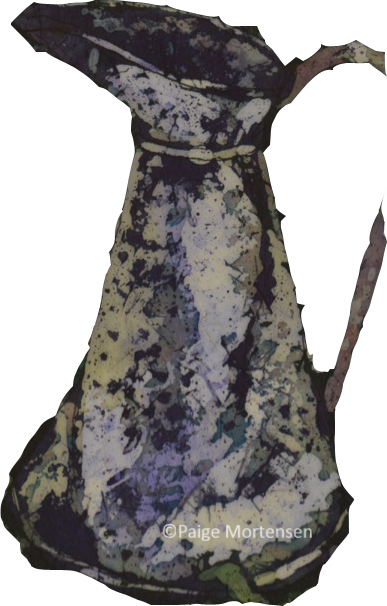 In the windows there was evidence of ordinary lives – cats on windowsills, flowers growing and laundry hanging out to dry. Again, the questions arose in my mind: who built these buildings? who lives her? and what are their lives like? One of my favourite memories of Venice actually started before we even got there and I owe it to YouTube. We were very thankful for the video showing us how to get from the S Zaccaria Vaporetto Station (water taxi) to the Hotel al Piave where we were staying. With these tiny streets going in all directions and water and bridges everywhere we would have been lost trying to get there. Having watched this ahead of time made it into a fun adventure instead! You can watch the video here: https://www.youtube.com/watch?v=TGvEjqFNOvQ. 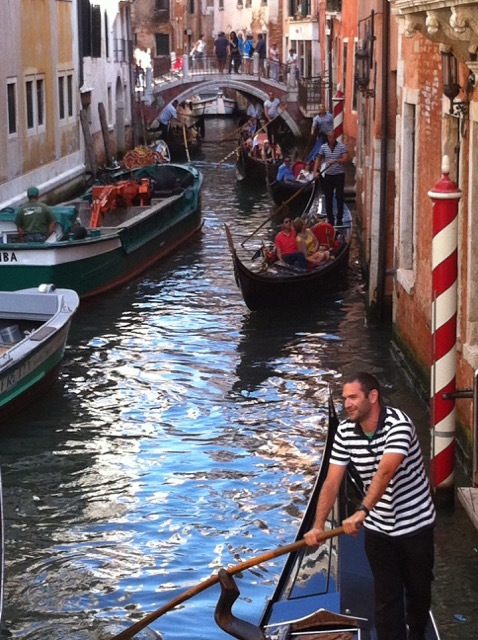 Some places were busy with gondolas and people everywhere. 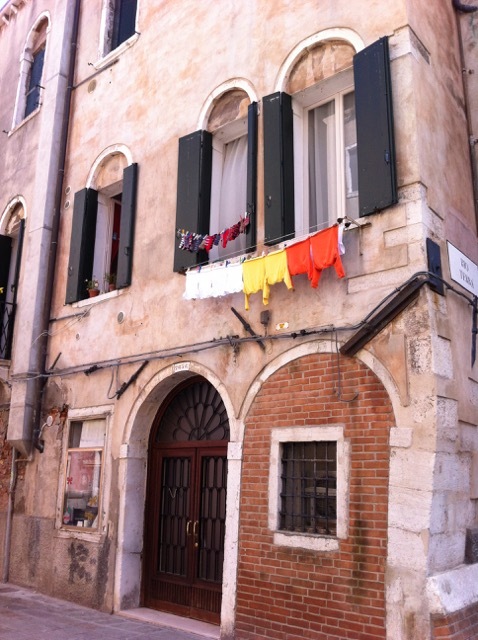 But then we found lots of quiet, peaceful spots where we could just enjoy being in Venice. Love the reflections! And my favourite spot in Venice! This piece is currently touring as part of the Dimensions 2015 show and at the moment is in Whitehorse, YT. Thanks for sharing my adventures! This entry was posted in Being an Artist, Inspirations, Out and About and tagged inspirations, Life, watercolour on September 16, 2015 by Paige Mortensen. A year ago we were in Rome! And what an amazing trip it was full of history and wonder. 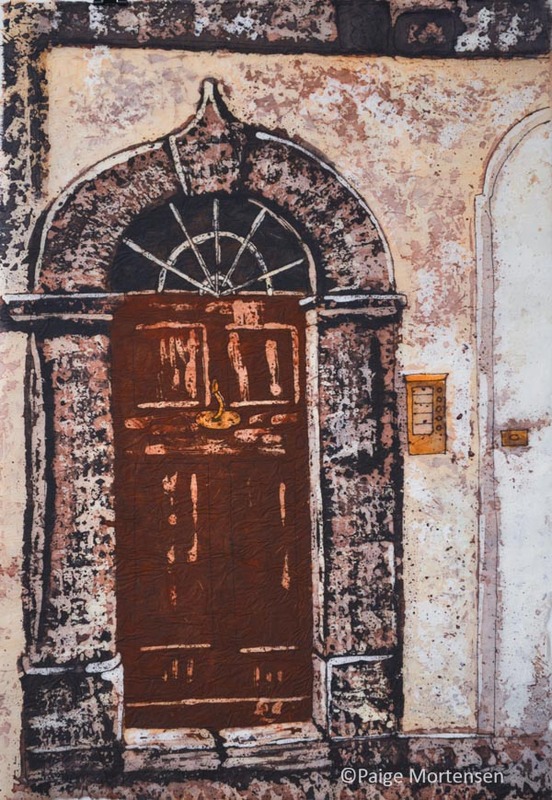 Inspiration was everywhere – from the ancient ruins to the doors that people use every day. 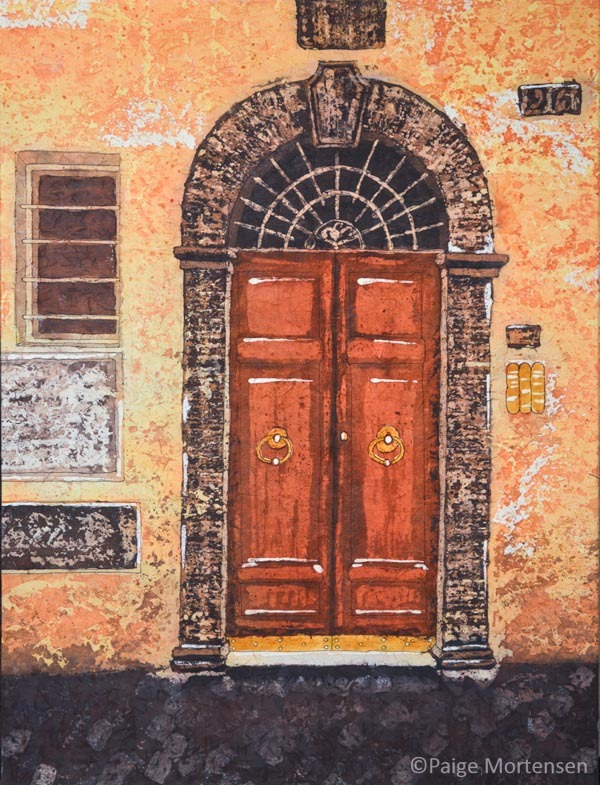 Some of the doors turned into paintings once we got home. All memories of a trip. 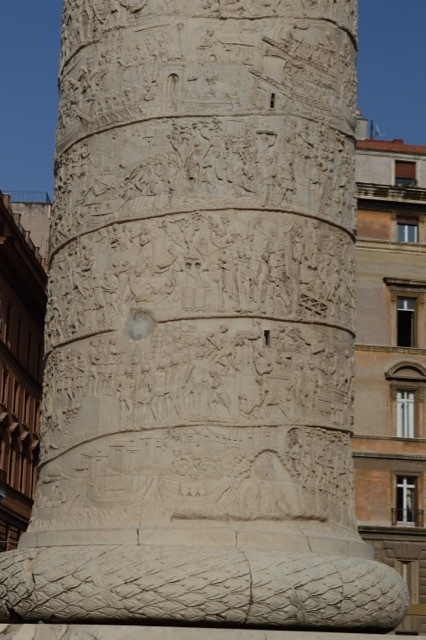 One of the first sites we came to was Trajan’s Column which is an amazing piece of ancient art! 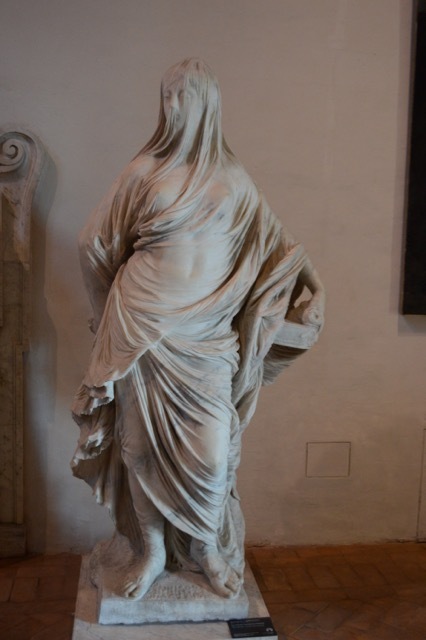 This marble column with its stand is about 125′ tall and 11′ in diameter. Spiralling around it 23 times is a frieze that tells the story of wars between the Romans and the Dacians from 102-106AD. 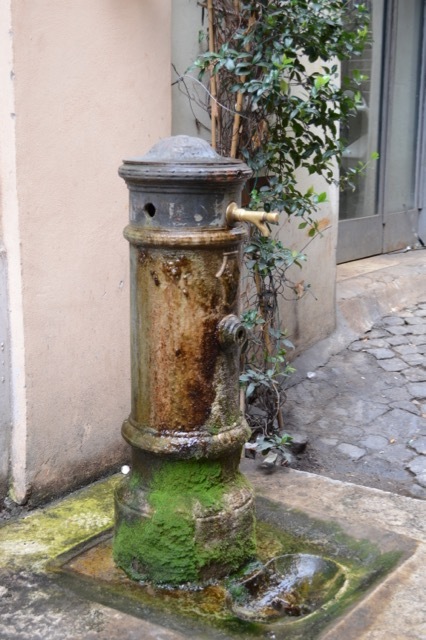 As a tourist we greatly appreciated the fresh, cold, drinkable water flowing from fountains around the city – originally built by the Romans 2,000 years ago. 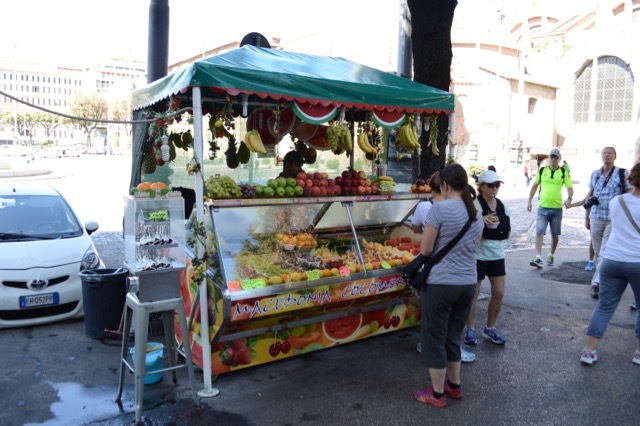 We also appreciated the modern fruit stands for their refreshing modern day treats! 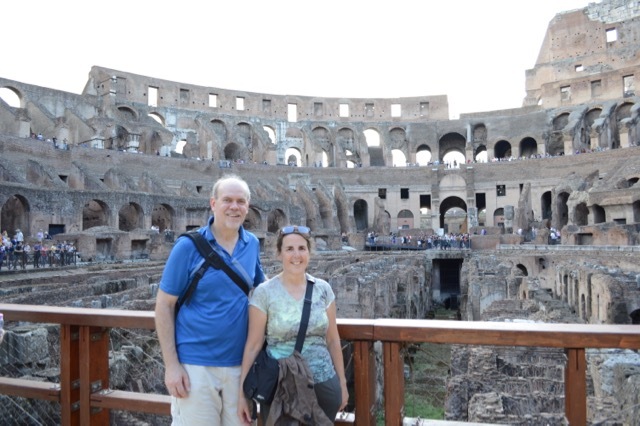 The Colluseum and Vatican were fabulous to see, as were the churches, statues and paintings! For me it will be the doors I remember as I continue to wonder who built them, how did they live, who lives there now? This entry was posted in Being an Artist, Inspirations, Out and About and tagged inspirations, Life, watercolour on September 9, 2015 by Paige Mortensen. This is the second part of my exploration of the concepts of wabi-sabi and boro. 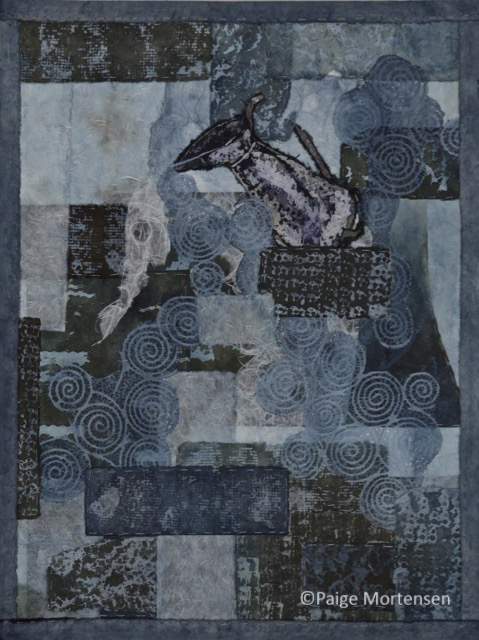 This exploration was inspired by Donna Watson‘s article “The Zen of Discovery” in the August 2015 issue of Watercolor Artist. For the first part of my story click here. 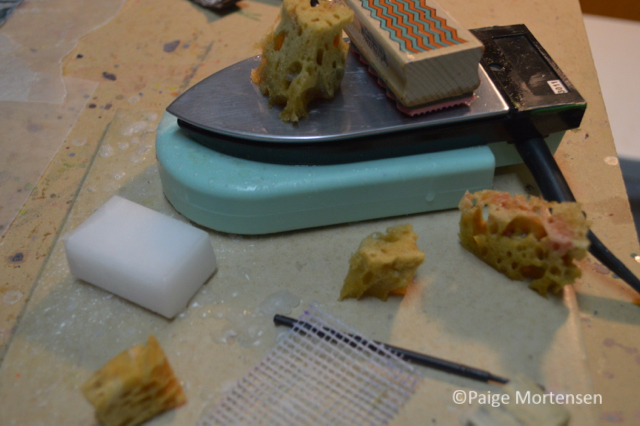 In Part 1 I explained how I had created the ‘scraps’ I would need to create my finished piece. Now I was ready to put them together. I wanted to bring the concepts of wabi-sabi and boro together with the thought that water and warmth are needed to sustain life. Working within this framework it was important to me to limit my materials to the pieces I had created, treat each ‘scrap’ as precious and ensure that I wasn’t wasting anything. As I laid them out it became apparent that this was going to be a 18 x 24” ‘quilt’. None of this was planned out in advance so placing the patches was a process of trial and error. As the composition came together I pinned the pieces in place and began hand stitching it together. I offer this piece as reminder to us all to bring the concepts of wabi-sabi and boro into our everyday lives. Wabi-sabi to help us accept and celebrate the imperfections in our lives – both in the things we own and the people we love. Boro to remember that the smallest everyday things are the most precious. 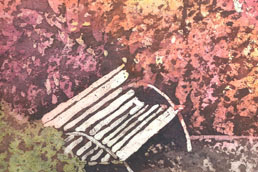 How will you explore wabi-sabi and boro in your life? 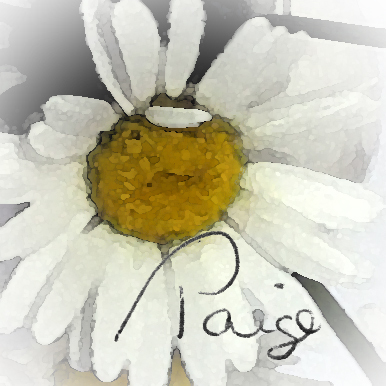 This entry was posted in Artistic Process, In My Studio, Inspirations and tagged creative process, inspirations, Mixed Media, watercolour on August 19, 2015 by Paige Mortensen. Summer is a time for breaking out of habits and trying something new. 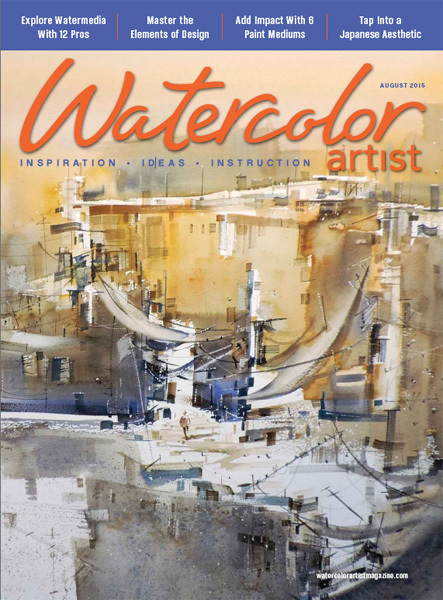 My inspiration came from Donna Watson‘s article, “The Zen of Discovery” in the August 2015 issue of Watercolour Artist. The article featured her work inspired by two Japanese aesthetics, wabi-sabi and boro and I knew I had to go exploring. The concept of wabi-sabi has been on my mind for a number of years. Donna describes it as “the Zen appreciation of things incomplete, imperfect and impermanent” and “an appreciation of things humble, modest, simple and minimal”. 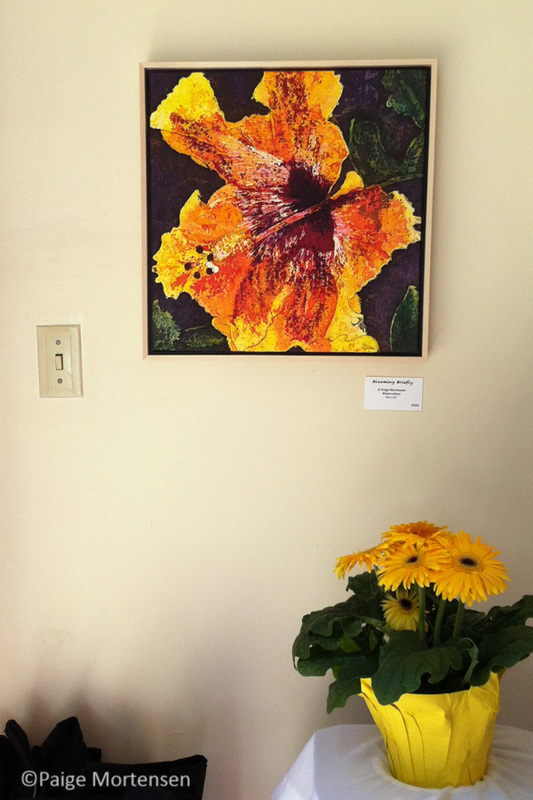 For me it has been about embracing imperfections – in my art and my life. Boro was a new concept for me. Donna describes it as “patched and mended rags” created out of necessity by north-eastern Japanese farmers in the 19th and 20th centuries. Small scraps of cloth, generally died with Indigo became very precious as the necessities of mending created quilt-like clothing and blankets. Washi is another Japanese term; ‘wa’ is Japanese, ‘shi’ is paper. Ginwashi paper is a very thin, strong paper with long fibres and I regularly use it for my watercolours. 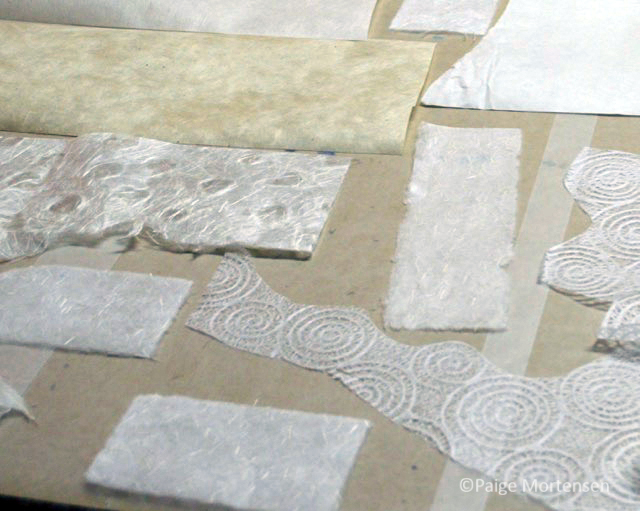 I also had some scraps of other Japanese papers, which I used to bring different textures into the finished piece. My favourite way of working involves layers of wax and watercolour. 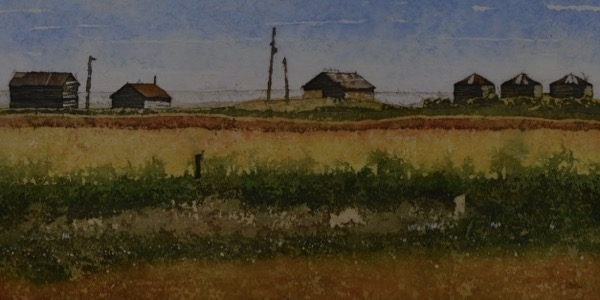 The watercolour layers are applied from light to dark with wax applied between layers to preserve the colour and value at that particular point. Once the wax is ironed off the finished piece has a textile quality that seems to be asking to be quilted or stitched. This was something I had only thought about doing and now was the perfect opportunity to do some experimentation. My first step was to recreate the concept of scraps. Recognizing that the peasants were only allowed to wear blue brown, black and gray limited my palette. 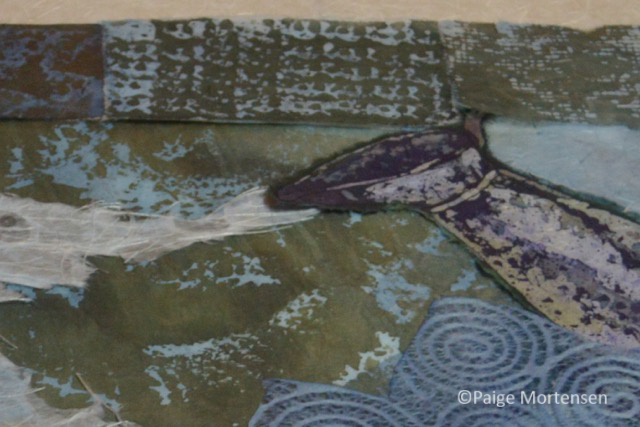 I had recently completed a not so successful piece with a beaten up water jug in it so I tore the jug out of it and there was the focus piece for mypaper ‘quilt’. Yes, the jug has some purple in it. Could that have been the result of aging? Or maybe I just took some artistic license here. 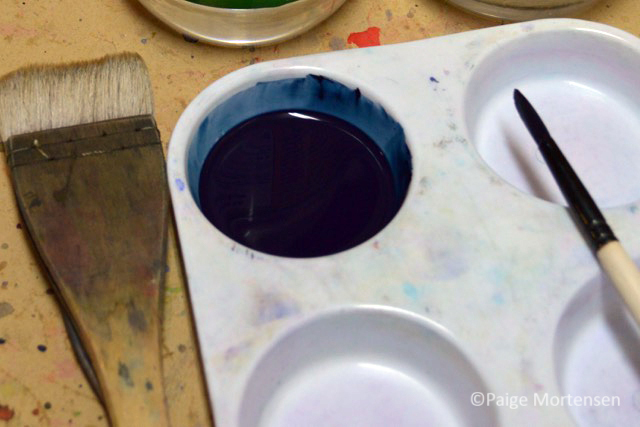 Out came the Indigo tube of Qor watercolour paint and I got to work creating textures. 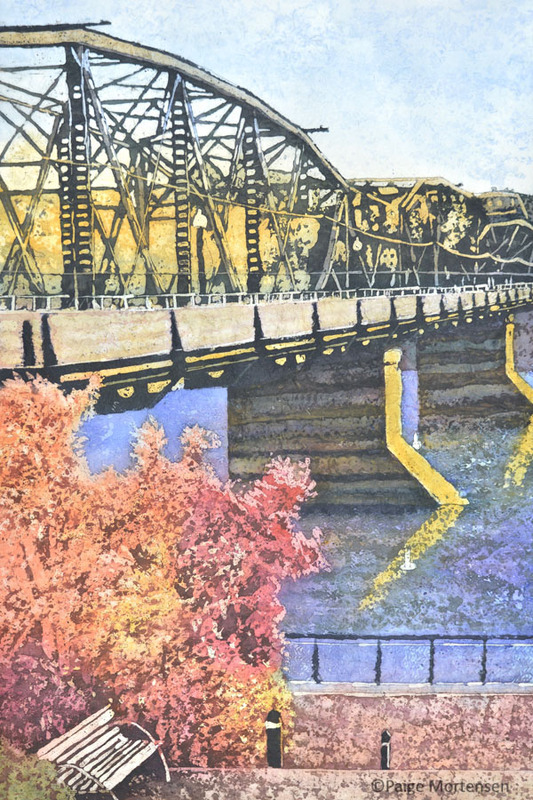 The first step was simply to paint all of the pieces with diluted Indigo watercolour paint. 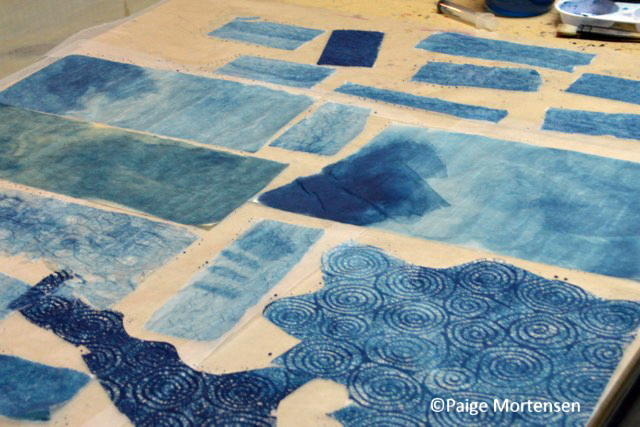 Once these dried it was time to add some wax with various sponges and stamps to preserve this shade and value of Indigo and create texture. These are the tools I used and the pieces with the wax applied. 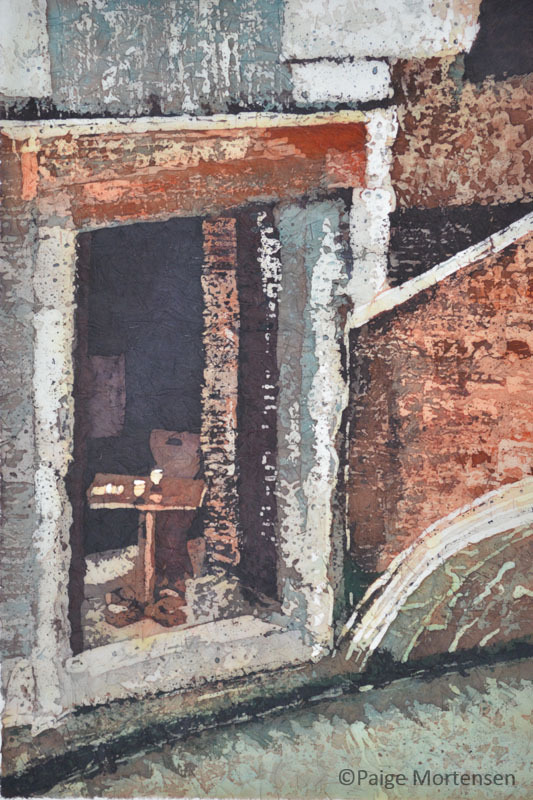 In order to create a worn and stained look I added Qor Burnt Sienna, Quinacridon Gold and Paynes Gray to my palette. Once I was satisfied with the scraps I coated the pieces completely with wax to give them an even translucency and seal the pigment into the paper. The last step was to iron these between layers of newsprint to remove the wax. Next week I will tell you about how these ‘scraps’ came together to express my interactions with the terms wabi-wabi and boro. In the meantime I invite you to consider how you too can explore wabi-sabi and boro in your lives. This entry was posted in Artistic Process, In My Studio, Inspirations and tagged creative process, inspirations, watercolor, watercolour on August 12, 2015 by Paige Mortensen. There are so many wonderful things about summer – and this summer water is one of them! While watercolour is my favourite art medium, I have been taking some time out to just enjoy water in many forms. 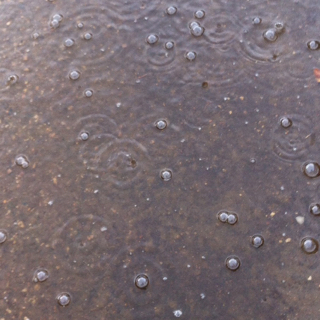 It is pouring out today but we went so long with no rain this year that it is wonderful to hear and see. We have a skylight in the living room and the sound as I sit here reminds me of camping and the sound of rain on the tent trailer roof. Wonderful, if wet, memories! 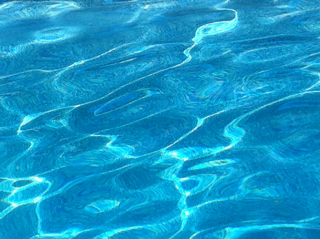 These beautiful swirls of colour in the swimming pool fascinated me. Combined with the sounds of my grandchildren’s swimming lessons they created another wonderful memory! And then there was a wonderful early morning walk by the water in southern Saskatchewan. 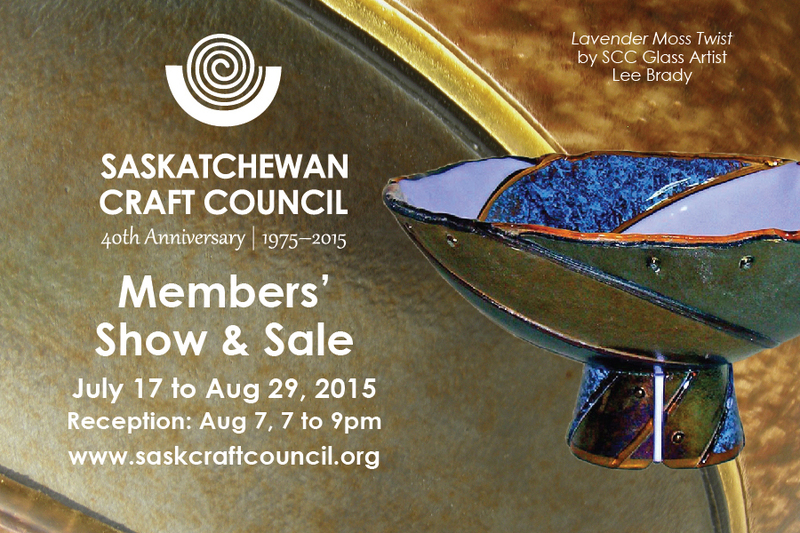 This week I am excited about the reception for the Saskatchewan Craft Council’s 40th Anniversary Members’ Show & Sale. 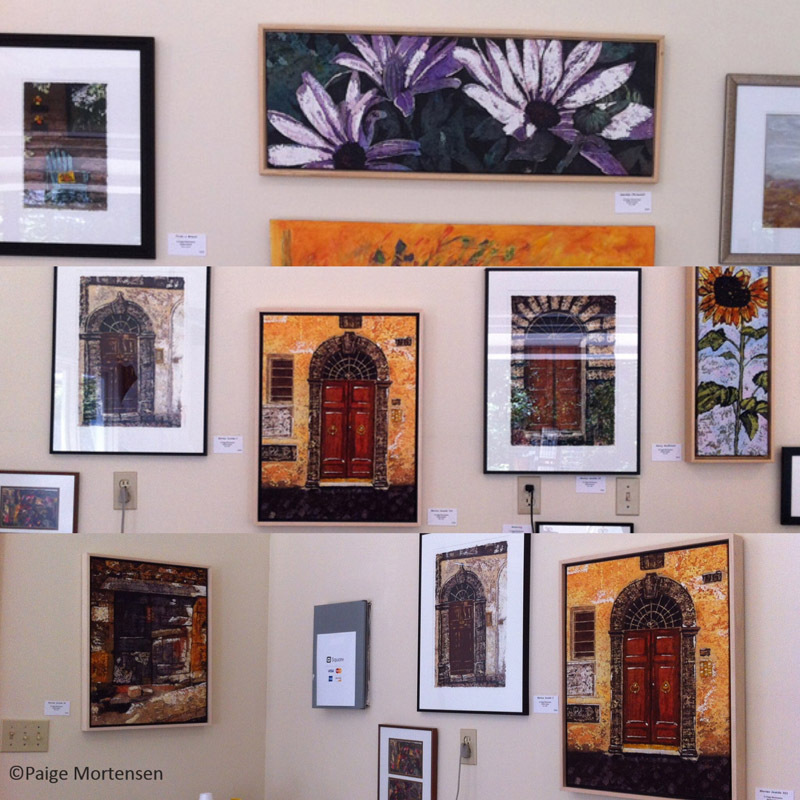 I am one of about 60 artists with pieces in the show. There is no water in these ones but they are watercolours! I hope you too can take a moment to enjoy water this summer! 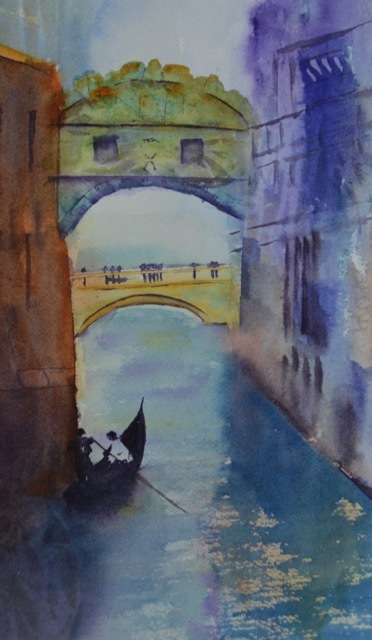 This entry was posted in Events, Out and About, Watercolour and tagged Community, events, Life, watercolour on August 6, 2015 by Paige Mortensen. 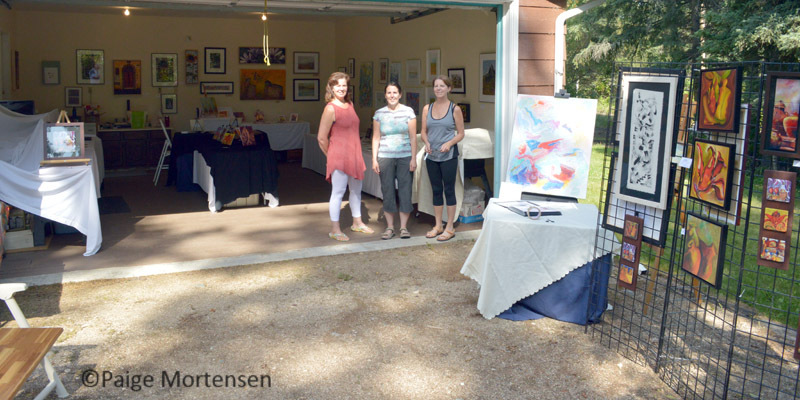 We couldn’t have asked for better weather than we had for the 2015 edition of the 263 Art Studio Tour! Thanks to Donna, we also had a fantastic venue in their family garage which even had freshly painted walls! 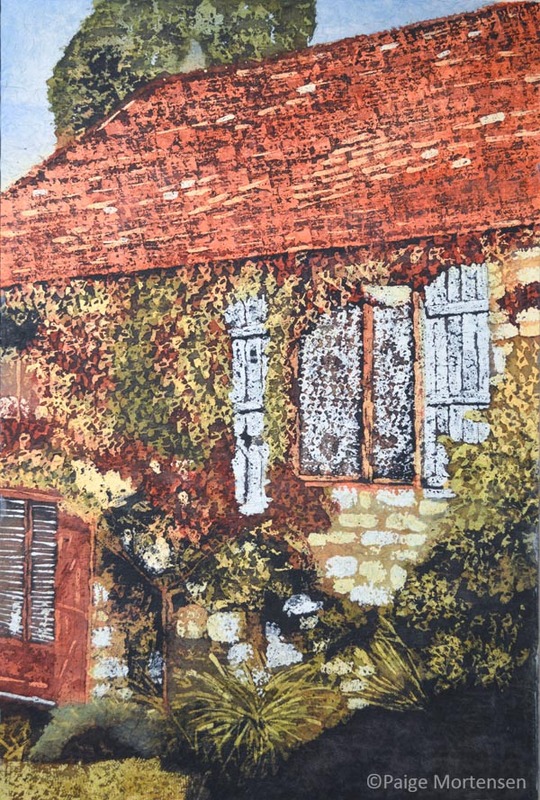 Donna Cessna is an acrylic and mixed media painter, Jeannette Lussier paints her originals in oil and then uses a colour sublimation process to create tiles from digital copies of the originals. 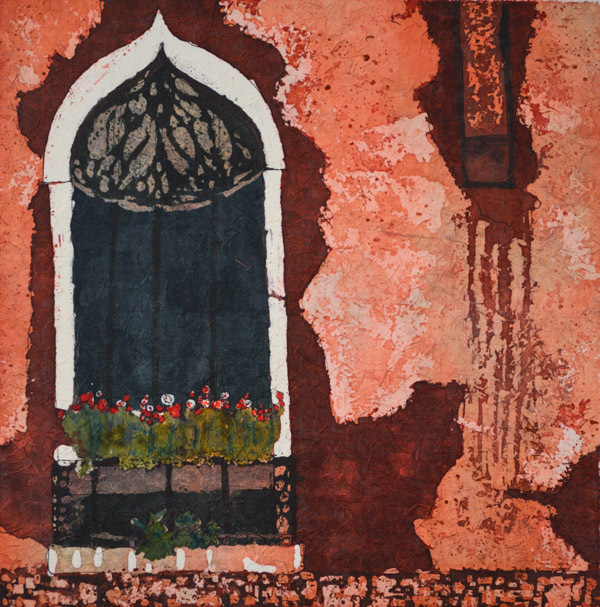 My works are watercolours done using a batik-like process on Ginwashi paper. Three artists – three individual styles! Here we are, ready to start making connections with our visitors. And connect we did. As I said in my last post, as artists we create the works but it is not until others view it that it is complete. Everyone who came by seemed genuinely excited to be on the tour and interacting with the wide variety of art. We enjoyed talking about our inspirations and processes. 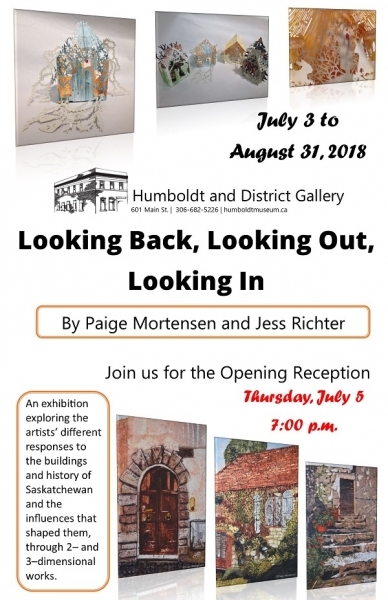 We had the opportunity to share our art with people who call Saskatchewan home and others visiting the area from Alberta, New York and Belgium. We heard stories about work they had already seen at other studios on the tour and talked about what they were going to see next. 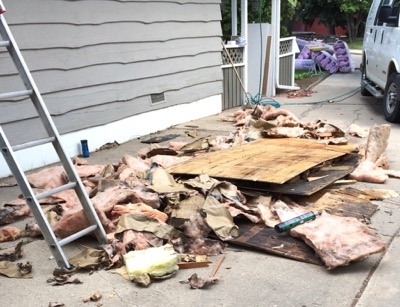 This is Saskatchewan and the seven degrees of separation between people seems smaller here so many of our conversations led to the people or places we knew in common. ~ I had time to get to know two wonderful artists! I enjoyed the weekend with both of you! 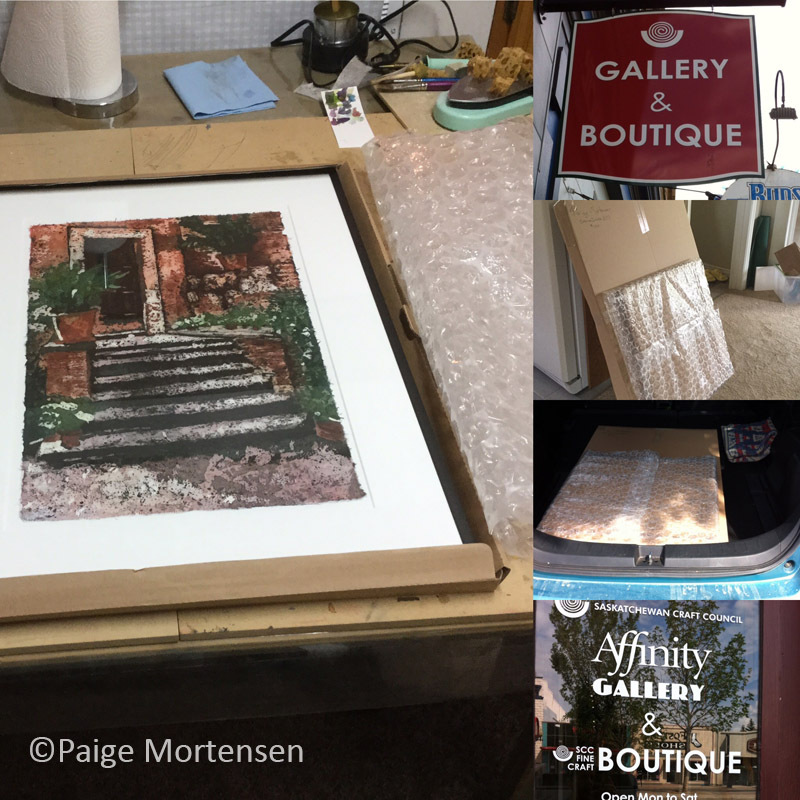 ~ Sharing the experience with family who drove 2 hours just to stop in and see our ‘gallery’! 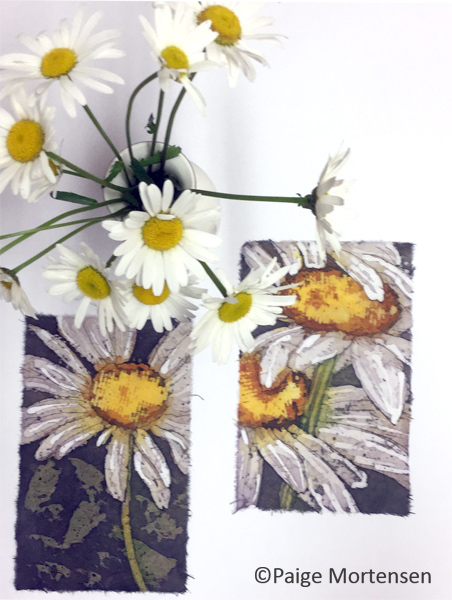 ~ After I got home a friend sent me a note saying: “A friend of mine was one of the visitors and just raved about your work, recommended that I look at it!” Funny that the visitor and I hadn’t found our link – but thanks to her for sharing her enthusiasm! 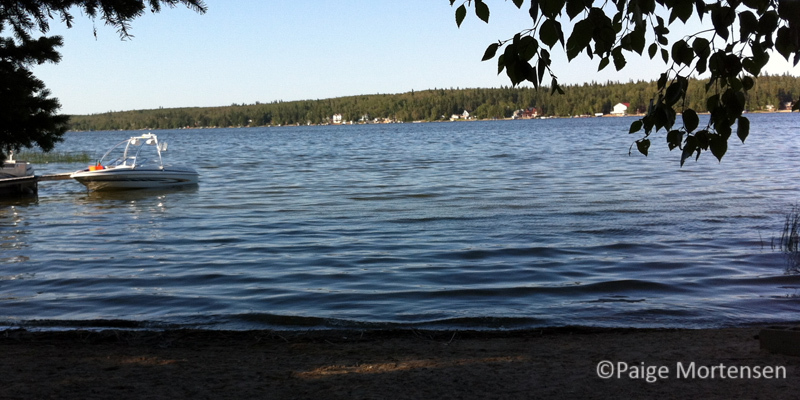 And, an added bonus was that we were at the lake and I could spend some quiet time sitting by the water! 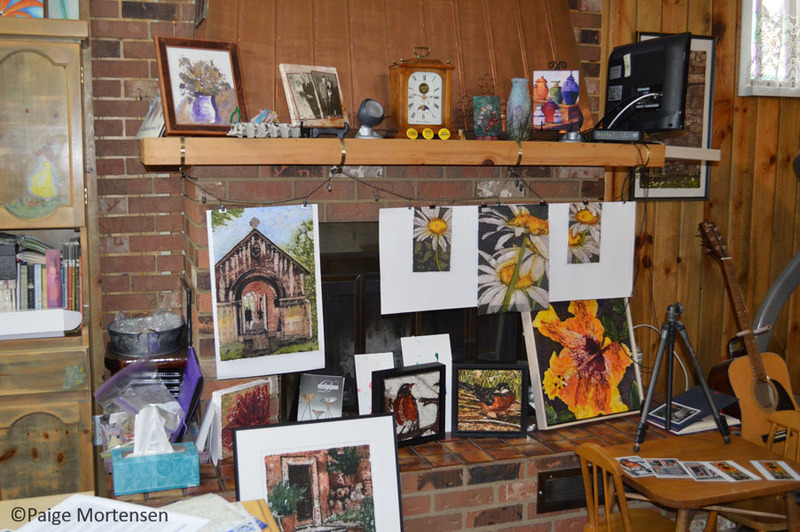 Thanks to everyone who participated in this year’s 263 Art Studio Tour! 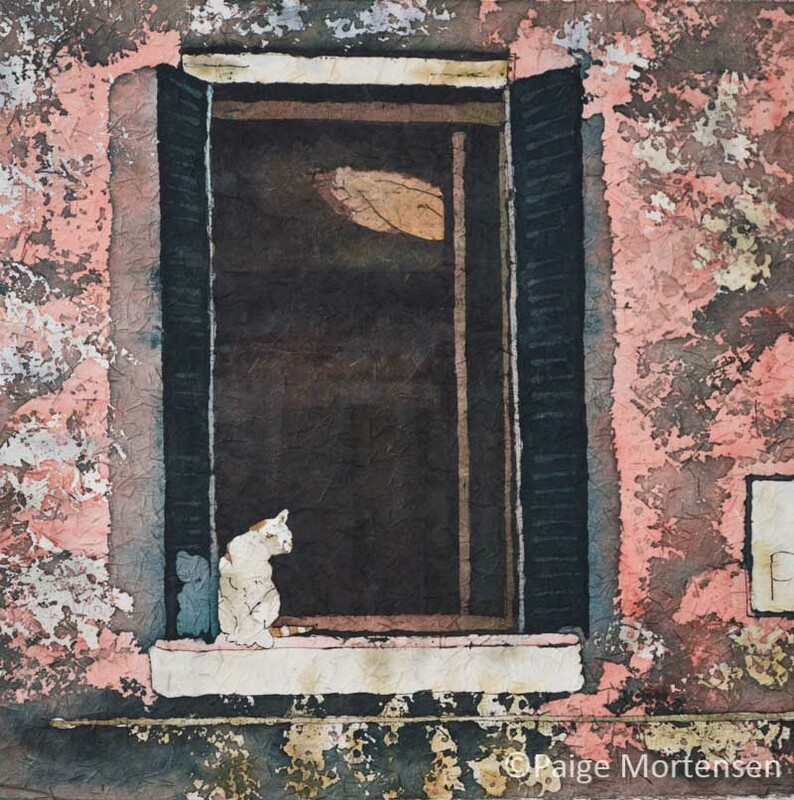 This entry was posted in Events, Uncategorized and tagged events, Show & Sale, watercolor, watercolour, Watercolour Batik on July 29, 2015 by Paige Mortensen. Today was delivery day! 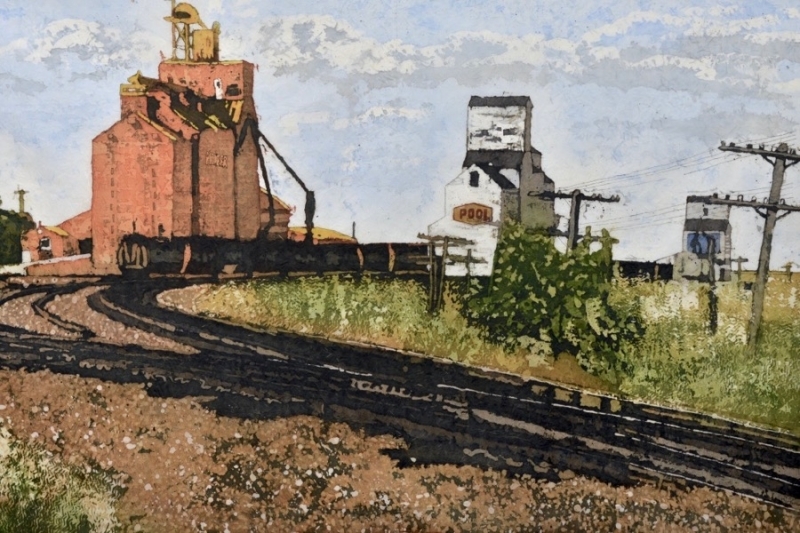 I dropped off my two watercolour pieces at the Affinity Gallery on Broadway Avenue for the Saskatchewan Craft Council 40th Anniversary Members’ Show & Sale July 17 until August 29, 2015. 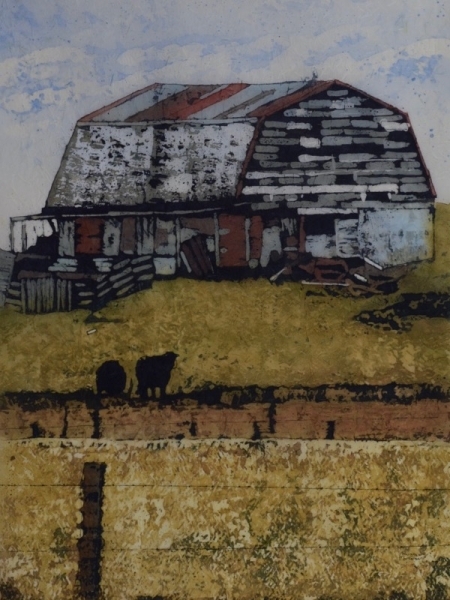 The show includes works by some of the Saskatchewan Craft Council’s founding members and others by emerging artists. 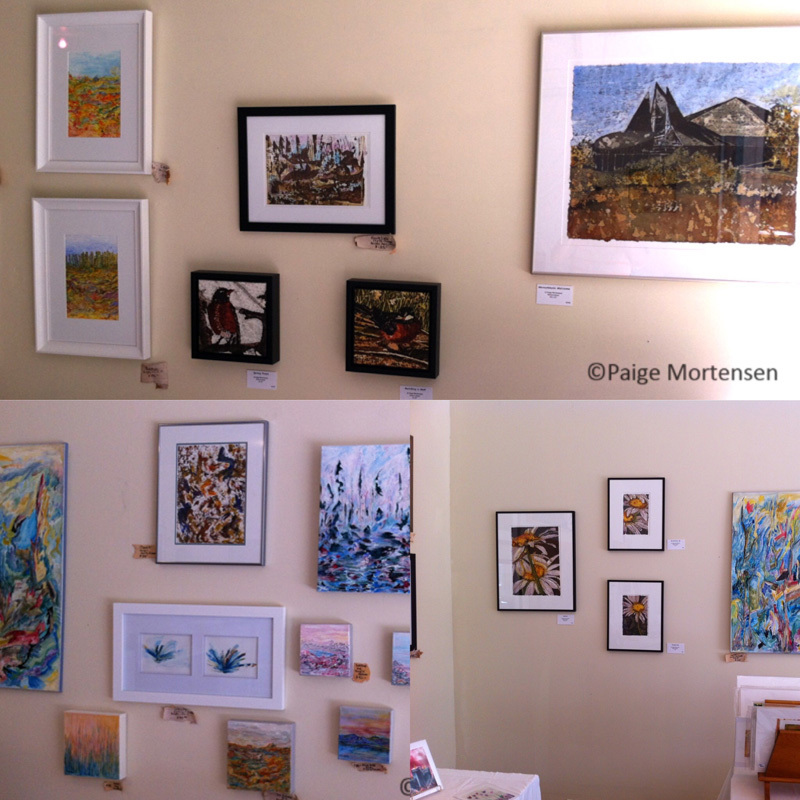 Over 50 artists working in fibre, ceramics, photography, wood, metal, glass, and visual art are included. As pieces are sold, they will be replaced with new ones so remember to stop by often as the show will be changing over the seven weeks. I am very excited that my watercolours will be a part of this and I plan to be there to see all the amazing works on Friday, July 17th! I will also be at the reception on August 7th. I hope to see you there! 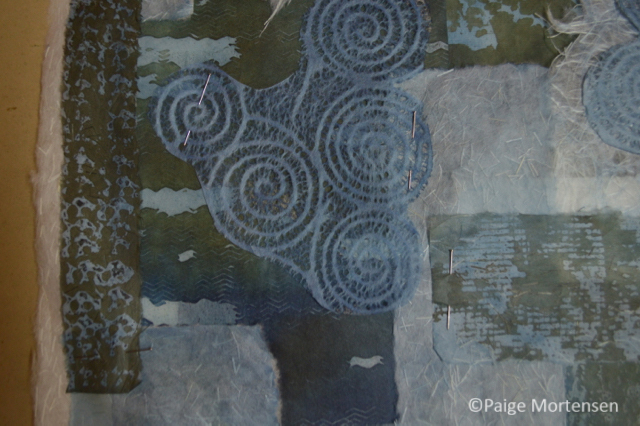 This entry was posted in Events, Watercolour, Watercolour Batik and tagged Show & Sale, watercolor batik, watercolour, Watercolour Batik on July 13, 2015 by Paige Mortensen. Raging forest fires are burning in northern Saskatchewan and at last report about 13,000 people have been evacuated. They have had to leave their homes and the relative quiet of northern living and come to big cities where many of them are living in gymnasiums full of people. Those that have stayed are fighting fires that are dangerously close to the communities. I wish them courage, strength and a safe return to their homes. We have a cabin about an hour’s drive from the major fires but we didn’t go this weekend because even here in Saskatoon the smoke was thick enough to keep us from doing anything outside. I feel very thankful to have the choice and to be safely here in my own home. 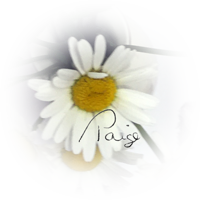 Daisies are one of the simple little things in life that make me smile and bring happy thoughts. They are blooming beautifully right now and some were sitting on my table. They just had to turn into paintings too. In the midst of the trauma of fires and being forced from their homes I hope the evacuees can find some simple things that bring a smile to their faces too. Wishing everyone a safe return home! 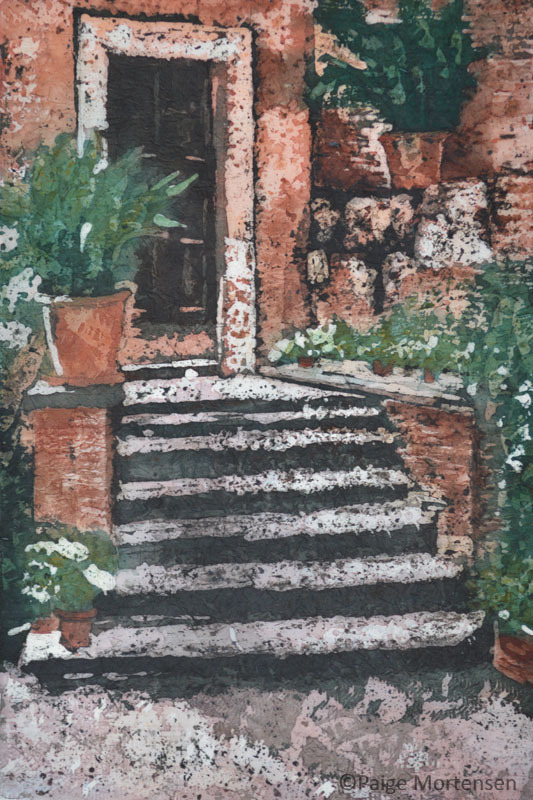 This entry was posted in Portfolio, Watercolour, Watercolour Batik and tagged watercolor, watercolor batik, watercolour, Watercolour Batik on July 6, 2015 by Paige Mortensen.